At any given time, there is no shortage of topics for me to write about. However, there are certain triggers that motivate me to my keyboard. One of those triggers is any business owner who thinks they are so smart that they want to sue someone into silence for expressing legitimate negative opinions and negative feedback. They trigger the infamous Streisand Effect and I do my small part to ensure it remains alive and well. I am certainly not a person or business owner who likes negative opinions or negative feedback written about me or my business but I absolutely know that the ABSOLUTE DUMBEST thing to do with negative feedback issues is to use a “non-disparagement” clause as a basis to sue an unhappy customer regarding negative Yelp feedback. It appears the Internet has gleefully rewarded “Prestigious Pets” of Dallas, Texas with free negative publicity from various news stories like the Dallas Morning News, Fox News, and The Daily Mail. 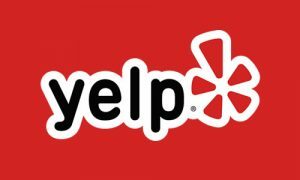 They have triggered a hornet’s nest of unhappy Yelpers going on the attack against Prestigious Pets’ Yelp account for the foolish $6,766 lawsuit against a customer who posted a 1-star Yelp feedback. Particularly ignorant is the business owner’s digging his heels into their position. According to Dallas News, they obtained an email quote “We are honest people seeking protection from dishonest individuals, not other honest ones. Fair and honest feedback is not the issue here.” I read the Yelper’s feedback against Prestigious Business and it appears to be a legitimately informative Yelp review. What is truly a travesty is the lawyer and law firm that sent the cease-and-desist letter and the lawsuit. I have reached out to the victims to find out what lawyer and law firm filed the papers. 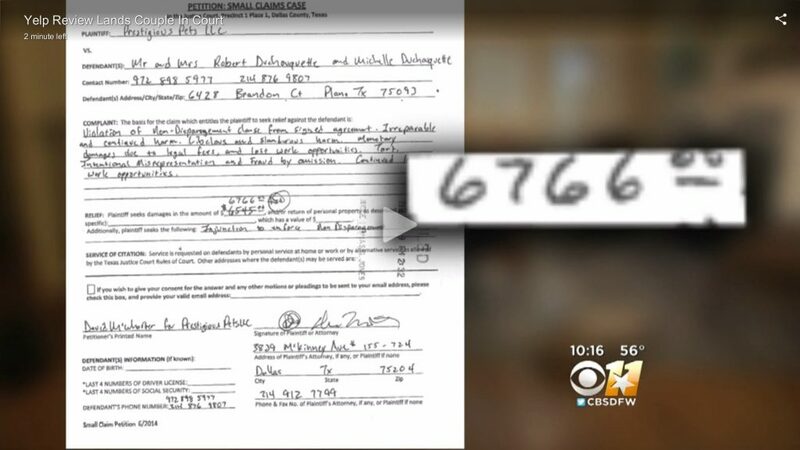 Update: From what I can tell from the CBS video, the cease-and-desist letter comes from the Law Office of Tom Fleischer. 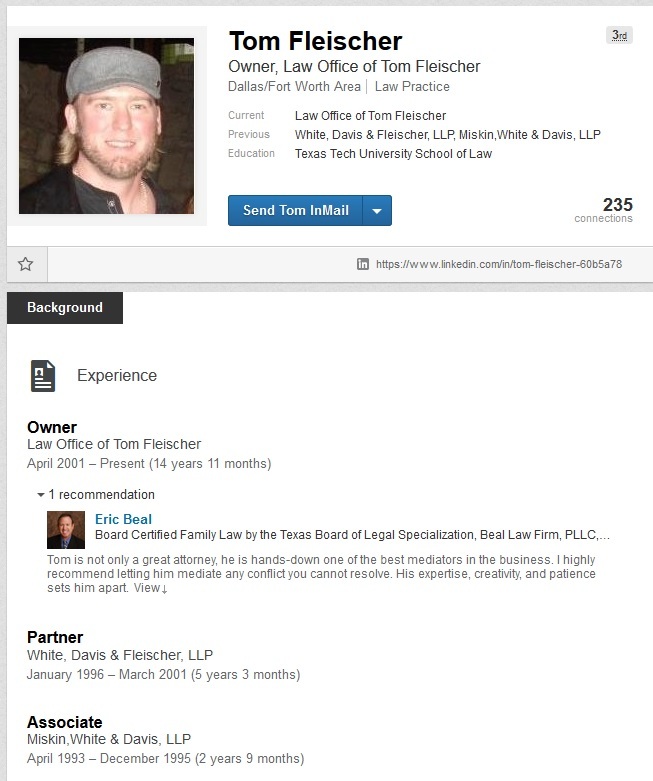 The Texas State Bar and LinkedIn shows this guy’s winning good looks. The small-claims complaint and lawsuit itself reveals that it was filed by David McWhorter(?) [partially-illegible last name] on behalf of Prestigious Pets LLC. 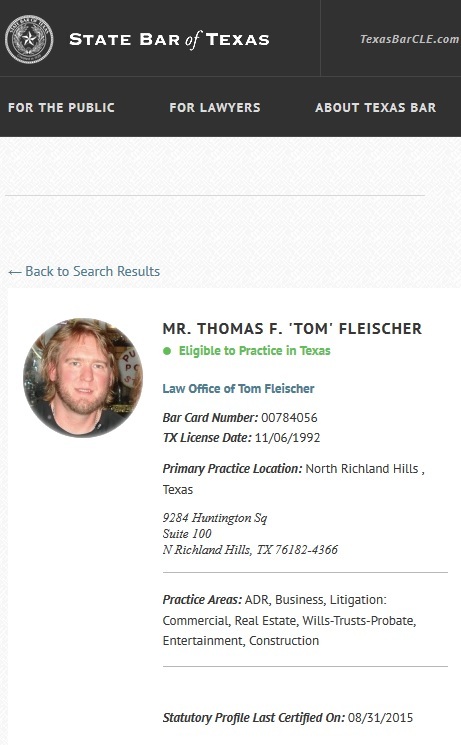 It does not appear that Texas lawyer Tom Fleischer filed this lawsuit. David is going to find out he is going to lose a lot more business by his ignorance of the Streisand Effect. And it might even be unenforceable due to First Amendment issues. He seriously needs to cut his losses and move on.